Imagine that your parents are living in the the comfort of their own home , with a private , full time, one-on-one nurse's aide, for less than the cost of a nursing home, and half the cost of 24/7 homecare! We help you do this for a onetime recruiting and placement fee of 5%. That is just 1/3 of the cost of having the same service done by an employment agency or recruiter. Quest Diagnostics is the world’s leading provider of diagnostic testing services, information and services that patients and doctors need to make better healthcare decisions. We contract with Quest Diagnostics to perform drug testing on candidates as part of the screening process. An Aging Life Care Professional, also known as a geriatric care manager, is a health and human services specialist who acts as a guide and advocate for families who are caring for older relatives or disabled adults. Employment Screening Service offers a broad range of different types of background screenings, such as county, state and federal criminal searches, employment and education verification. HomePay's comprehensive, guaranteed service specializes in taking care of all the payroll and tax aspects of being a household employer, so that families don't have any work, worry or risk. Considerably less expensive than a nursing home. 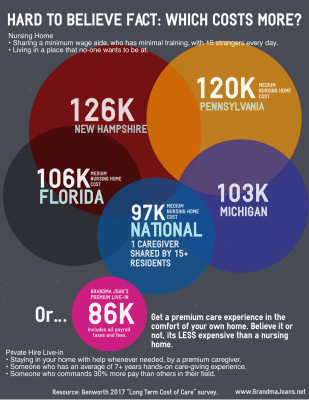 The average nursing home in the US cost $8,365 a month in 2018. That's for a small room with little personal space, and always waiting for help to come to your room to do anything. The average home-care agency rate for 24/7 help at home is $16,060 a month. Thats for 4-6 different caregivers, coming and going on rotating shifts. Under our model, privately hired 24/7 live-in caregiver rates start as low as $6,400 a month in some states. Get a no obligation rate quote now. What do you have to lose?